Two weeks ago I was walking about our backyard looking for greening strawberry plants. Now, the last week of March, the lowering of the jet stream has brought cold temps back into the Northern Virginia area and now I am hoping the frosty mornings won’t be harming the strawberry leaves that have started to green. 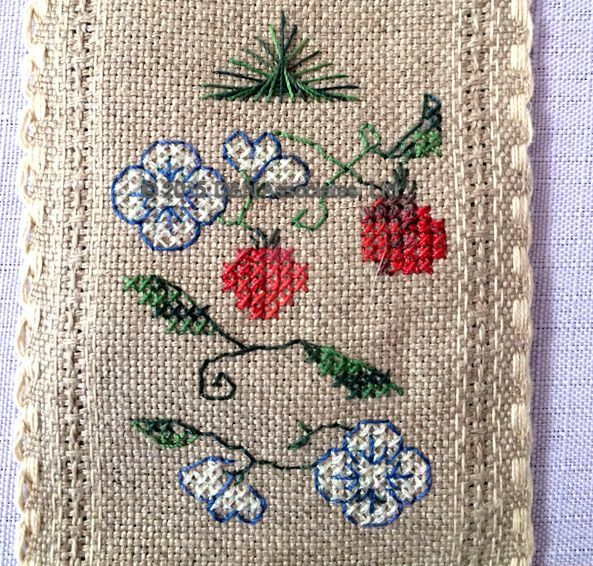 For Christmas my sister gave me Permin of Copenhagen hardanger kit (63-1684) which is a Table runner design that has strawberries and flowers. 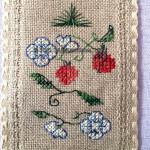 I haven’t gotten a chance to begin stitching the Permin strawberry table runner yet, but I so like the cheerful strawberries and flowers that I decided to incorporate a small snipe of them into a short bellpull. I had no pattern other than for the strawberries and flowers. 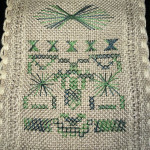 I just used which ever stitch I felt worked for that row or area as I proceeded in working this short bell pull. The worked area is 9 inches by 3 inches. 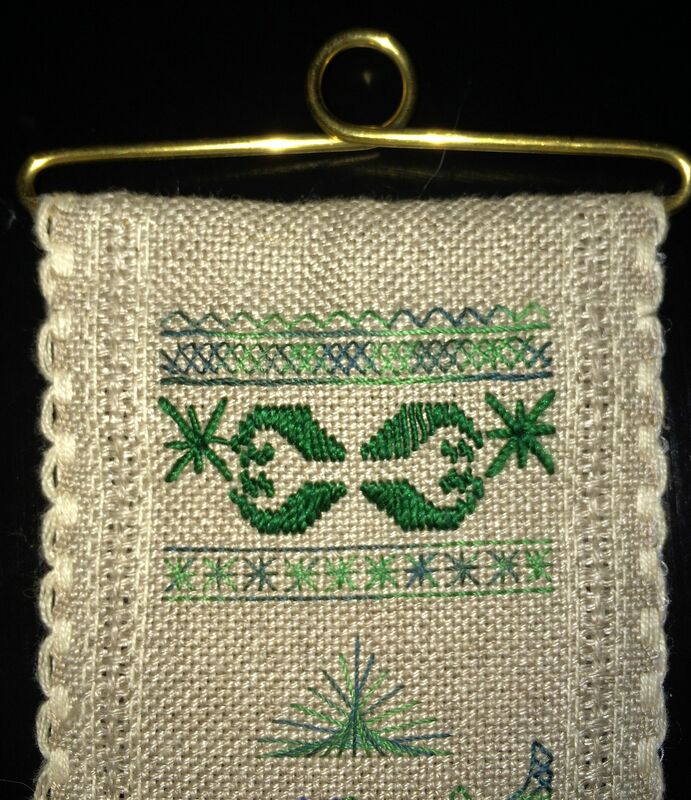 The brass color bell pull hardware is from Nordic Needle. The natural color even weave banded linen is 24 count. 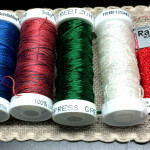 Sulky 12 wt blendables (#4051-Forever Green, #4055-Royal Navy, #4007-Brick Red), Trebizond silk (#125-white and #717-Cypress Green) and to add sparkle within some areas of the strawberries I used Rainbow blending thread (#617-red). 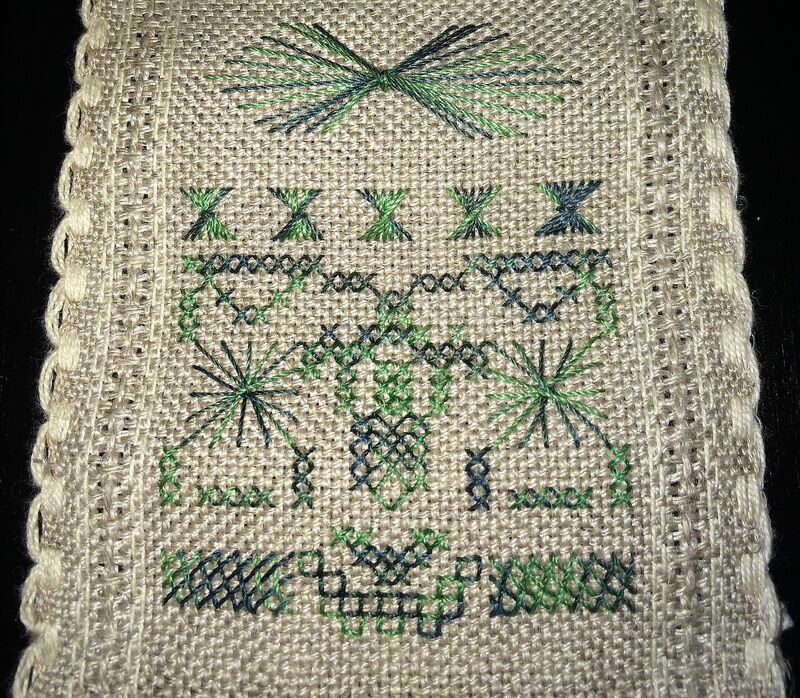 I had planned to put four yellow cross stitches in the middle of the two larger flowers but decided I did not want to introduce any other colors into this worked piece. 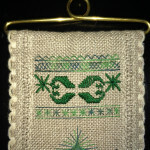 You can see from my design that I enjoy Rhode stitches and so incorporated several of them as I worked.